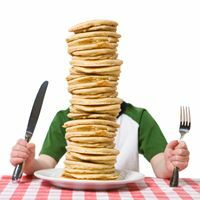 Sherston 1016 is organising its annual Pancake EATING Competition on the evening of Shrove Tuesday, March 8, from 7.30pm at the Rattlebone Inn. Entries will be welcome in advance or on the night, and the competition has senior and junior classes. The competition will take place in heats, with each competitor paying a mere £2 entry fee for the whole evening. Each entrant will have 4 delicious freshly-cooked pancakes to eat in the first heat. Entrants will have time to add lemon and sugar to their taste, then the clock will start, and the first heat will be under way. The winner of each heat will be the first to finish eating all the pancakes on their plate. These winners will then go on to the next heat, again with four pancakes each, and so on until the championship round. The winner will have their name engraved on a 1016 commemorative engraved frying pan. There will also be runners-up prizes. The competition is a revival of one that took place in the area around 25 years ago, with great success. Local organisations are encouraged to take part, and individual entries will also be welcomed. Any entrant not feeling able to continue at any point will not be pressured into continuing. “Where possible, all ingredients are sourced locally, with eggs coming from Sherston Free-Range Eggs, flour from Shipton Mill at Long Newnton, and lemons from Tucks greengrocers and butchers, although of course, the lemons are not grown in Sherston, or even in Luckington!. All three companies very kindly donate their products for the competition”, adds Richard. If you would like more details of this fun competition, or would like to book your entry, please contact Richard Langley on 01666 840112 or 07879 612776. Sherston 1016 strongly advises all entrants not to eat a meal before coming to the competition!